Diana Scrimgeour’s authorized book on U2 SHOW: The Art of Touring is out on Riverhead Books on October 21st. Scrimgeour, a photojournalist, traveled with U2’s Elevation tour observing and documenting the story behind the show to produce what sounds like the visual companion to the fan written tour ‘bible’ U2 Live: A Concert Documentary. 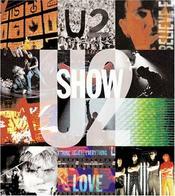 SHOW contains interviews with many of U2’s closest associates and crew and more than 500 photos. It will cost $35 and can be ordered online (Amazon USA/UK) or in your local bookshop (ISBN: 1-57322-296-8).